View Italy, nearby (3,5km), and mountains; Residential area, Apt. in villa, nestled in lush greenery in the heart of a bay, a few steps from typical and picturesque streets of the old village. CALM - South - IDEAL COUPLE alone or with a child - Near beach and center. Furnished and raised garden terrace overlooking the panorama. A little 'trouvaille' on the Mediterranean coast, this small but for two persons comfortable appartment (hopefully you will be staying in the garden or or the terrace enjoying the good weather the largest part of the time anyhow) is located in the 'villa' part of town, next to the historical quarter of Menton. Looking at the left you will see the gorgeous coastline of Italy, looking to the right you see the postcard image of the old town. Incredible the waking up -having slept with the gardens doors open- seeing the Mediterranean straight from your bed. We had a nightingale singing in the olive tree in front of the house a few times. The setting is private (my opinion as a city person), even though apartment is located on the first floor of a villa and you are aware of each others existence. Friendly owner. The only minus I found (July 2010) was the length of the week rent: arrival on Saturday after six in the evening, and departure the next Saturday at ten in the morning (which didn't quite feel like a weeks rent). But all in all, looking back on a wonderful, romantic, laid back week, in the comfort of modern village city life (shops, transport etc), but at the same time with enough privacy away from it all to get really well rested. 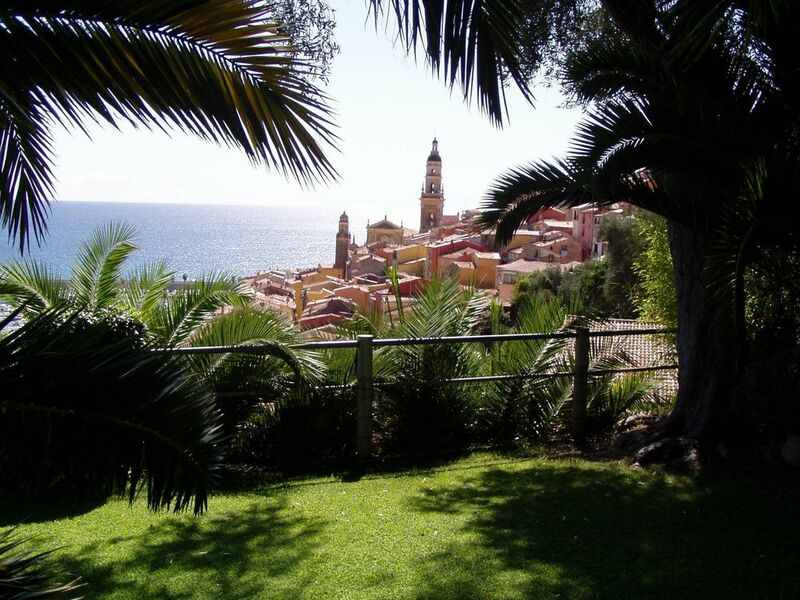 Petit studio fonctionnel à proximité des ruelles médiévales de Menton avec une vue imprenable sur la côte italienne, les ports de Garavan et Menton et l'Eglise ST Michel. Pas besoin de la voiture pour se rendre au centre de Menton ou au bord de mer. De plus, cet appartement bénéficie d'un garage à proximité pouvant accueillir de grosses berlines. Nous avons séjourné une semaine avec notre petit d un an et demi chez Marie-Noëlle et vraiment nous recommandons cette location. Elle est très bien située et offre un panorama magnifique. Nous avons passé d excellents moments avec Marie-Noëlle et son fils et avons apprécié leurs conseils. Nous y reviendrons avec plaisir lors de notre prochaine visite dans la région. Die Ferienwohnung hat einen schönen Garten und eine nicht ganz so gute Aussicht wie auf den (veralteten) Bildern dargestellt. Der Rasen darf nicht genutzt werden. Ruhe kehrt erst um 18.00 Uhr ein, da von 7.00 bis 18.00 Uhr einem der Baustellenlärm in unmittelbarer Nähe den Schlaf und die Erholung raubt. Die Wohung ist sehr klein (max. 30 m²) und mit Kind auf keinen Fall zu empfehlen. Bei dem Bad handelt es sich um ein sehr enges WC ohne Fenster und Lüftung mit Waschbecken und Dusche. Zu den Restaurants, Läden und dem Strand ist es zu Fuss zu weit, ein Fahrzeug wird benötigt. Das Preis- Leistungsverhältnis stimmt nicht und die Vermieterin war auch nicht bereit uns für den Baustellenlärm mit einem Nachlass zu entschädigen. Wir empfehlen diese Ferienwohnung nicht!!! OLD VILLAGES POLES nearby to visit. Les tarifs mentionnés par saison sont une base à titre indicatif. Au cours d'une même saison, nos tarifs peuvent varier (+ - 10 à 25 %) et être ristournés ou majorés en fonction des évènements locaux , régionaux, périodes de vacances scolaires, jours fériés , week-end de fêtes, durée séjour. Nous acceptons sous réserve d'entente préalable les animaux de petite taille.